We're back near the beginning of the book. We started on week 17 of Queen of the Castle: 52 weeks of encouragement for the uninspired, domestically challenged or just plain tired homemaker HERE (in April). This week's chapter is "Giving Homemaking Our Best". Lynn begins by lamenting that being a homemaker in our culture is not a valued position. Those who trivialize it have obviously never done it. (Can I get an "Amen"!?) "Those of us who run a home every day have a thorough appreciation for the enormity of the task, even when our children no longer ride around in grocery carts. Counters do not wipe themselves, socks do not wash themselves (or turn themselves right side out), mail does not answer itself. Those of us who run a home know there is always more to be done." 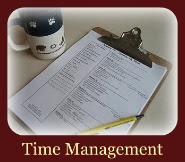 This homemaking business is a 24 hour a day, 7 days a week, 52 weeks out of the year job. It's a job. It's an important one! Sometimes those who are closest to us are the ones who haven't a clue what our job entails. I can picture Lynn saying this with a twinkle in her eye: "If that special someone in your life hasn't yet had the opportunity of running your home for a time -- even if it's just a day or two -- consider going on a weekend women's retreat or maybe a short visit to a relative. Give him the gift of discovering just what a homemaker's job entails. Attitudes around your home may never be the same." I am very thankful that I have a husband who is very capable of running our household when I'm gone. He may not be able to make more than stir-fry or grilled cheese, but he's very capable of managing our home in my absence. He knows what needs to get done and sees to it that the children are doing their jobs, that they are clean, healthy and fed (he knows the number to the local pizza delivery, too!). At the end of the day he enjoys getting down on the floor to read books, play checkers and have a good old fashioned tickle fight. He's also a very willing grocery shopper. He enjoys the coupons and sales; the thrill of the hunt. (Insert my best Tim the Toolman Taylor manly grunt here.) I am blessed! I hope you are, too. However, if you aren't feeling very appreciated around your home consider praying and then talking to your husband in a loving manner. Lynn warns us, though, not to fall victim to the mentality that since we don't get paid in money (hugs and kisses don't count to society) that we look to other public commitments to get our accolades. Lynn warns "...if organizing the bake sale or directing the Christmas play come at the expense of dirty laundry that's beginning to emit interesting smells from our back room, it may be time to back off from some of our more public activities. Our families pay a price when we are overcommitted." Don't give all the good parts of you away so you have nothing left to give to those at home, ladies. Dr. Mary Ann Froehlich ("What's a Smart Woman Like You Doing in a Place Like This? Homemaking on Purpose") says "Consider the following 'log in the eye' situations. Sally teaches gourmet cooking classes two evenings a week while her family is home eating TV dinners. ... Kathy diligently prepares and teaches two Bible studies a week. She does not have devotions with her own children." Seek the Lord first, then care for our families, then serve our communities. Lynn encourages us to look at this wonderful opportunity of home making as a ministry. Let's not compare our homes and meals to others. "We are each unique, "immaculately unique" as one author puts it. God has given us "varieties of gifts, but the same Spirit. And there are varieties of ministries, and the same Lord" (I Corinthians 12:4-5). We have different gifts and different ministries. Why do we think our homes should look the same?"